Welcome to a brand new post. I'll try and keep this one short. I was going to create a student giveaway, due to freshers happening, but sadly a few of the brands have not been great with timings, therefore I thought that I would just keep it one of my favourite beauty companies ever. 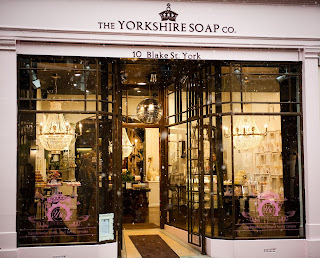 The Yorkshire Soap Company! As I mentioned above, I wanted to do a freshers based giveaway, as I know that, going to college/university can cause a strain on your bank balance, and well we all have to be clean and fresh. As freshers has sadly been and gone, I have decided to class this as a sort of more Happy October giveaway. I am collaborating with Yorkshire Soap Company to give you all a chance of winning the whole collection of the Cocktail Fizz Bars, which comes in four amazing scents. Mojito, Cosmopolitan, Kir Royale, and, Margarita. You can either break a piece off and use it in your bath to give yourself a fun and amazing smelling bath, or you can hod a piece of the fizz bar under the running water in a shower. What this means, is that if your accommodation doesn't have a bath, then you can still use these! Also, as a special thank you for being with me throughout my blog journey, I am also including Yorkshire Soap's new Limited Edition Soap. Monster Mash Soap smells of a deep autumnal Spiced Pumpkin scent and includes a special finger puppet! All you have to do is enter via the Rafflecopter link below. There is a couple of compulsory ways of entering. Sadly, if you don't do these then you won't have a chance of winning the prizes. You must be a UK resident. I will not be able to ship these internationally. All details given within the giveaway will not be used or given to any third party users or corporations and will only be used to contact the winner of the giveaway. The giveaway will end on the 22nd of October at midnight GMT. Any entries after that will not be counted or regarded. If you are allergic to any of the ingredients to the products received, then it's not my fault, and its best to contact Yorkshire Soap Company, and to stop using the products immediately. I wish you all good luck and I hope that you come back next time for another post! This post is in collaboration with Yorkshire Soap Company but I am putting my own thoughts and money into it via adding an additional item. All views, opinions and ramblings are my own. Do You Wanna Build a Snowman is my favourite item at the moment.